I had a major craving for trout the other day and since the I was able to go out and catch my due to the time of year, I sauntered on down to my local fish monger, ( I just love using the words ‘fish monger’) purchased some of these beauties and began to create a culinary delight based on the recipe provided by a very good friend. I hope you will all enjoy and let me k now how it turned out! Make 3 slashes on each side of the fish. In a 13” x 9” baking pan- mix lemon juice with salt and pepper. Add the fish to the pan and turn over to coat both sides with the marinade. Cover and refrigerate for 3 hours. In a 1 quart saucepan over a medium heat toast sesame seeds until golden; while shaking and stirring the pan. Add butter and heat until melted. 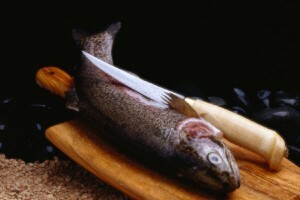 Place fish in broiling pan; drain marinade from pan into sesame seed mixture. Broil fish about 5 minutes on each side basting frequently with sesame mixture. When flesh is flaky, lift carefully onto warm platter. Spoon hot juices over fish and serve.